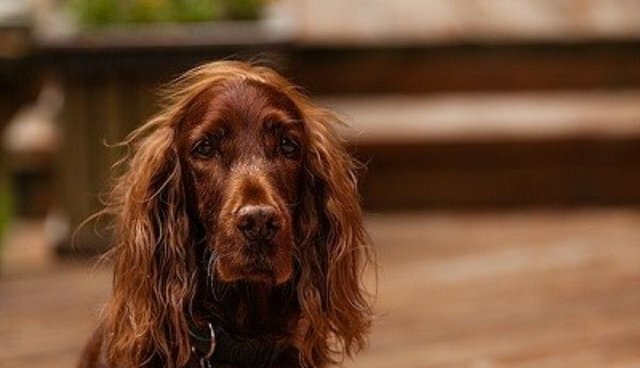 My father used to have a large lumbering Irish setter named Thora. Sad to say she was equipped with a brain the size of one lonely canned pea. Thora would spend the lazy hazy days of summer lying out in the middle of the country dirt road just snoozing her life away. No one could get that dog to move, and it's a wonder she never got run over. On car rally Sundays drivers were advised on their maps they had to maneuver around one big red dog lying in the middle of the road. Thora had a serious admiring suitor named Frankie, and he was the tiniest farm dog I ever saw. He just loved Thora, and each day he would literally spring up the road to come visit his love. He would lick her face continuously and then proceed to bark at her for hours. Thora never moved, just closed her eyes, and one might say they simply were having a silent love affair. As the summer months progressed, Frankie's love for Thora turned to lust. Try as he may, consummating this relationship was quite difficult for one so small. Occasionally she would stand up and come to the house for water and there was Frankie, barely twenty inches from her tail. Jumping and barking like the dickens, the more he couldn't do the deed, the more smoke seemed to be coming out of his ears. Thora in her own dazed world couldn't have cared less. Word got around the neighborhood and it became the talk of the county how this little dog would do anything to make Thora his. My father, always the comedian, continued to tell the "dog in lust" tale to anyone who would listen. He never really had an ending to this doggie tale until one fall morning when he came back from his walk grinning from ear to ear. That very morning he said, he had seen Frankie trot up the road dragging something behind him. Trying to keep a serious face my father said that Frankie was last seen toting a step ladder. Everyone laughed knowing a dog dragging something like that up a dirt road would be quite the sight, let alone impossible. Well, maybe that fateful morning Frankie did indeed bring along a step ladder. Small as Frankie was, we all knew he was the most talented cattle dog in the valley, and obviously he pulled off a magic act that day. A few months later, Thora gave birth to six puppies and there was never doubt in anyone's mind to who the father was. My father, delighting in more fodder for his volume of stories added more to his tale of wonder. Frankie had been last seen passing out cigars as he dragged his step ladder back down the road. I guess dreams do come true, no matter how short you are!